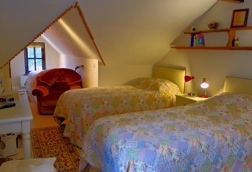 An L shaped room with twin beds or superking bed and a single in a connected alcove. Perfect for parents travelling with a child. 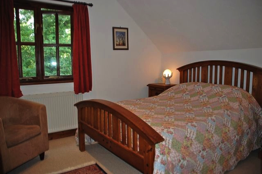 A single room with glorious views across the garden. Wash basin in the room; toilet and shower downstairs. 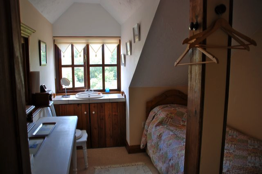 A comfortable room with en-suite including bath with shower over. We are happy to cater for special diets, and eggs for breakfast are freshly laid by our own hens! Each room benefits from free WiFi.